Two guest posts back to back. Is Jini getting lazy? Never. When I see something I'd like to share with my readers that falls under the "I couldn't have said it better myself" category, I have to reprint it. This post was taken from nutrition and fitness coach Joel Marion’s blog. He explains what can be defined as "organic" food (produce in this case), perfectly to my liking and has some great information about why buying organic is worth the extra money…..
.....As I write this newsletter, I'm doing a little late night snacking on a batch of organic cucumbers (marinated in vinegar, yummmmm) from my local CSA. Now, you've probably heard that there are benefits to eating organic, but if you're like most people, you may still be a tad confused about the whole "organic" thing (as is proved by all the organic-related emails that regularly come through my inbox). Perhaps you've wondered, what exactly makes something "organic" and why is it better than the regular stuff? Or maybe, what makes organic produce so darned expensive, and is there any way to enjoy it without burning a hole in my wallet? We'll start with some boring (yet helpful) definitions. For a food to be certified organic, it must meet certain USDA's criteria. For produce, this means that the produce must be grown without using most conventional pesticides, fertilizers made with synthetic ingredients or sewage sludge; bioengineering, or ionizing radiation. There are obviously other criteria when talking about meat, but for today we'll stick with produce. 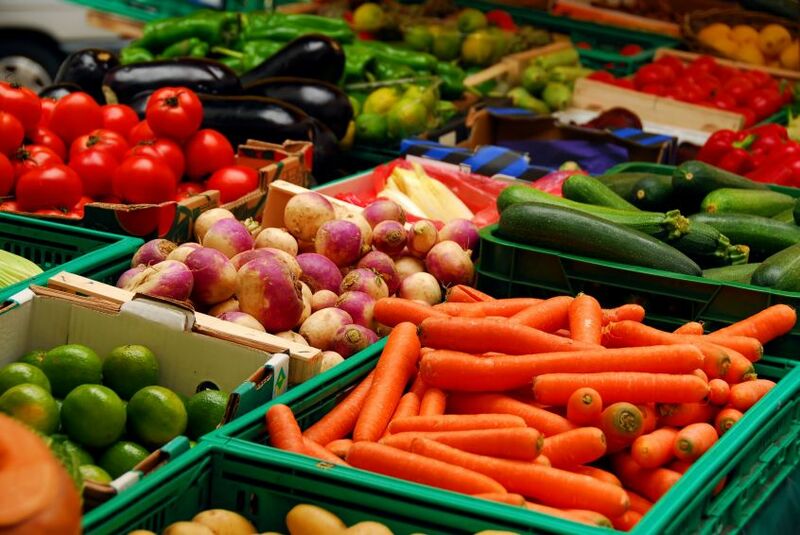 As far as cost is concerned, if you're buying organic produce at your average supermarket, then yes, you will certainly pay considerably more than the adjacent non-organic fruits and veggies. That said, a simple solution is to shop elsewhere for your organic needs. As I mentioned several times before, I do the CSA thing (community supported agriculture). Basically, I've got all the organic produce I could dream of from June - Thanksgiving, for a very reasonable price. Another alternative to joining a local CSA is simply stopping by your local farmer's market. Health food stores are third option, but I'd recommend checking out circulars and going for what's on sale when shopping at these outlets. Organic produce that is fresh and in season can be just as affordable, if not more so, than the regular stuff at the grocery store. Buying in bulk can further decrease cost. As we all know, that 5-gallon tub of mayonnaise is always a steal compared to the cost of the equivalent 20 individual jars. Remember, produce will always be cheaper in season, so stock up at the right time and then freeze the rest (frozen produce can easily last months once purchased and will still taste great; simply thaw and enjoy). This gives you the double-whammy savings of buying in season and in large amounts.